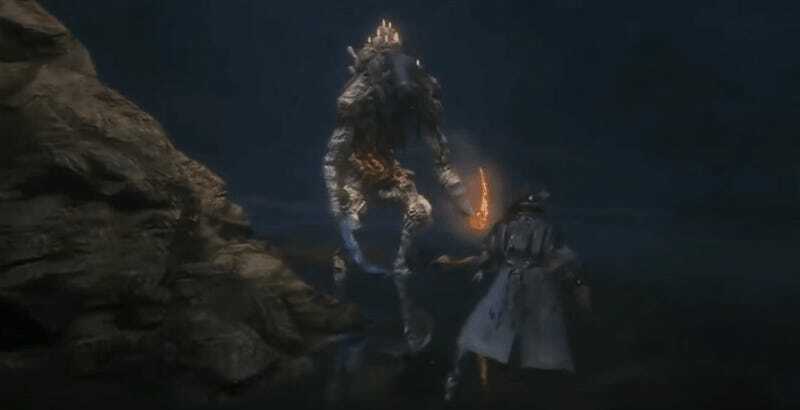 In 2014, some early Bloodborne footage showed off a big enemy with a flaming hand. It has taken until November 2017—long after fans assumed this beast had simply been cut from the finished product—for that enemy to actually be found within the game. As Moros Nyx shows in the video below, in 2014 a Flaming Undead Giant was shown as part of a demonstration of the game’s Chalice Dungeons. When Bloodborne was released in early 2015, however, that bad guy was nowhere to be seen. Bloodborne...released in March 2015, but the Flaming Undead Giant was nowhere to be found in the dungeons. Along with other things such as Boss Rush and the Revered Great One’s Coldblood, this version of the Undead Giant was generally declared as “Unused Content”, that is, not having made the final cut of the game. Three years later, on 19th November 2017, a group of Tomb Prospectors, led by KolbrotKommander (the creator of the dungeon) made the impossible discovery by officially sighting the first ever Flaming Undead Giant in a Depth 4 Cursed and Defiled Root Chalice. And so it goes full circle. There’s two things to note here. The first is that you can use the glyph pa6ssc6u to check it out for yourself. The second is that this opens up the possibility that there are other previously undiscovered enemies lurking within the game’s code, emboldening those who are digging around in there to dig a little deeper.